What Does an ACL Tear Mean for All-Star Rajon Rondo? 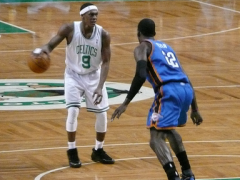 Boston Celtics star point guard Rajon Rondo will miss the rest of the season after tearing the ACL in his right knee. He injured his knee while playing against the Atlanta Hawks in last Friday’s game. Originally it was believed to be hyperextended, but tests showed that the ACL was torn. The ACL, or Anterior Cruciate Ligament, is one of four tendons that stabilize the knee joint and connect the femur to the tibia. It runs from the back of the femur, or thighbone, to the front of the tibia, or shinbone, and prevents the tibia from moving too far forward. The ACL typically tears during a twisting or cutting motion, such as during a sudden deceleration, awkward landing, or blow to the leg from the front. It’s one of the most common injuries for athletes, with basketball, soccer, and football all considered high risk sports. A twisting injury. When the foot is planted and the body turns, the ACL is most susceptible to injury. Early symptoms of ACL injuries are bruised, stiff, swollen, and difficult to move knees. According to Rondo’s coach, Doc Rivers, Rondo initially thought that he’d simply pulled his hamstring. He arrived at TD Garden ready to play in Sunday’s game against the Miami Heat, but was taken to the hospital after complaining of pain. Rivers only learned 25 minutes before the game that Rondo wouldn’t be able to play. ACL tears can be treated with surgery or physical therapy and rehabilitation depending on the patient’s age and level of activity; however, surgery is usually recommended for those who wish to lead extremely active lifestyles. The Celtics have already announced that Rondo will be undergoing ACL reconstruction surgery, but a date for the surgery has not yet been scheduled. He’s planning to speak to a second doctor to discuss his best course of action for a quick recovery. ACL reconstructive surgery can be a complicated procedure. It’s rare to be able to repair the torn ACL by simply reconnecting the torn ends. Most surgeons favor using a graft made of tendon taken from elsewhere in the patient’s body to replace and reconstruct the ACL tendon. Tendon can also be taken from a cadaver if the patient’s ACL is particularly unstable or at risk for instability. Synthetic grafts are rarely used because of high failure rates, but they are being further researched and may become more prevalent in the future. 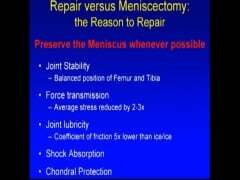 Unnecessary Knee Arthroscopies Still Being Performed?